GOJoven International celebrated its 10th anniversary with a Youth Leadership in Sexual and Reproductive Health and Rights Symposium and Anniversary Fiesta on March 29, 2016 at the Washington Inn Hotel in Oakland, California. Over the past decade GOJOven has equipped 250 young Fellows with the leadership, technical skills and networks needed to become change agents and work in partnership with other youth and adolescents, service providers and decision makers to improve adolescent sexual and reproductive health (ASRH) in Mexico and Central America. Through the Fellow’s community action projects and newly formed local, non-profit Alumni Associations –GOJoven Guatemala, GOJoven Mexico, GOJoven Honduras and GOBelize–, they have created a multiplier effect, engaging over 35,000 youth directly through educational workshops and awareness-building and advocacy actions that are directly impacting ASRH programs, services and policies at the local, national, regional and international levels. 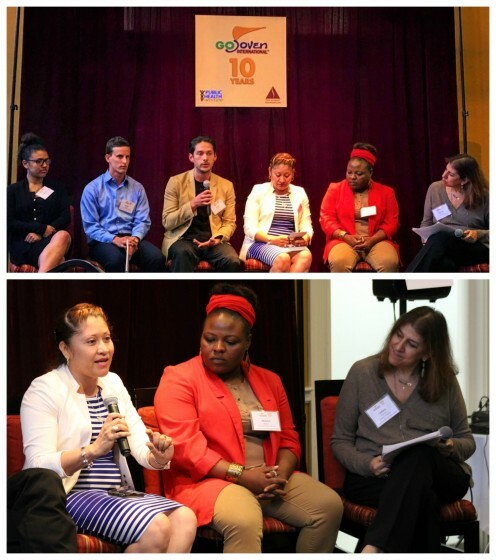 To highlight these important milestones and the positive impact of youth leadership on ASRH outcomes, GOJoven International convened PHI’s California Adolescent Health Collaborative (CAHC), FACES for the Future Coalition and Youth Champions Initiative and local partner YTH (Youth + Tech + Health) to organize the Youth Leadership Symposium. Representing GOJoven were GOBelize Alumni Association Executive Director Eva Burgos (Belize, 2004) and GOJoven Alumnus Karina De la Torre (Mexico, 2008), along with youth leaders from the Bay Area and Mississippi representing the hosting organizations, Kathy Hall representing GOJoven’s primary donor, the Summit Foundation, and representatives of the David & Lucile Packard Foundation and the Bill & Melinda Gates Foundation. 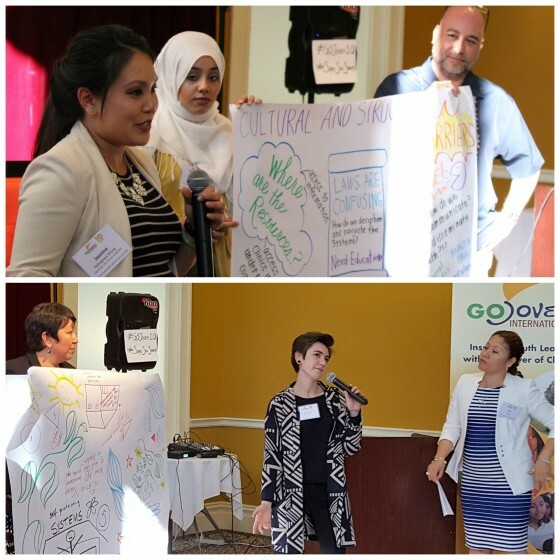 GOJoven International’s Founder and Director, Esther Tahrir, served as MC and co-organizer of the event along with GOJoven Project Coordinator Susanna Moore. “Youth Speaks” Talk Show featuring Eva Burgos, Executive Director of GOBelize, and other youth leaders from CACH, YTH, FACES and YCI and Tamara Kreinin of the Packard Foundation. Through a “Youth Speak” Talk Show and World Café, youth facilitators led discussions on urgent topics topics affecting youth locally and globally, including consent, confidentiality and cultural barriers in accessing sexual and reproductive healthcare services, vulnerability and sexual exploitation of at-risk youth and adolescents, dating violence, teen pregnancy and reproductive rights, and innovative youth-centered prevention strategies. FACES, YCI, RYSE and YTH representatives introduce key topics in an Opening Plenary to the World Café. Over 60 participants engaged in dynamic, cutting-edge dialogue and mind-mapping about how to leverage youth leadership development toward improving adolescent sexual and reproductive health and rights (ASRHR) locally and globally. The symposium gave local, national and international young leaders the opportunity to voice their experiences and priorities regarding pressing ASRHR issues and engage adult allies and donors in a discussion on how to make their rights a reality. World Café facilitators from YCI, GOJoven, FACES and YTH share mind-mapping outcomes from discussions on teen dating violence and gender stereotypes, and cultural and structural barriers that youth face in accessing sexual and reproductive health care. Local and global experts from the health, education, technology, legal and philanthropy sectors echoed the youth leaders’ calls to raise young people’s voices to decision and policy makers and program designers to meet youth needs and improve their health and wellbeing. 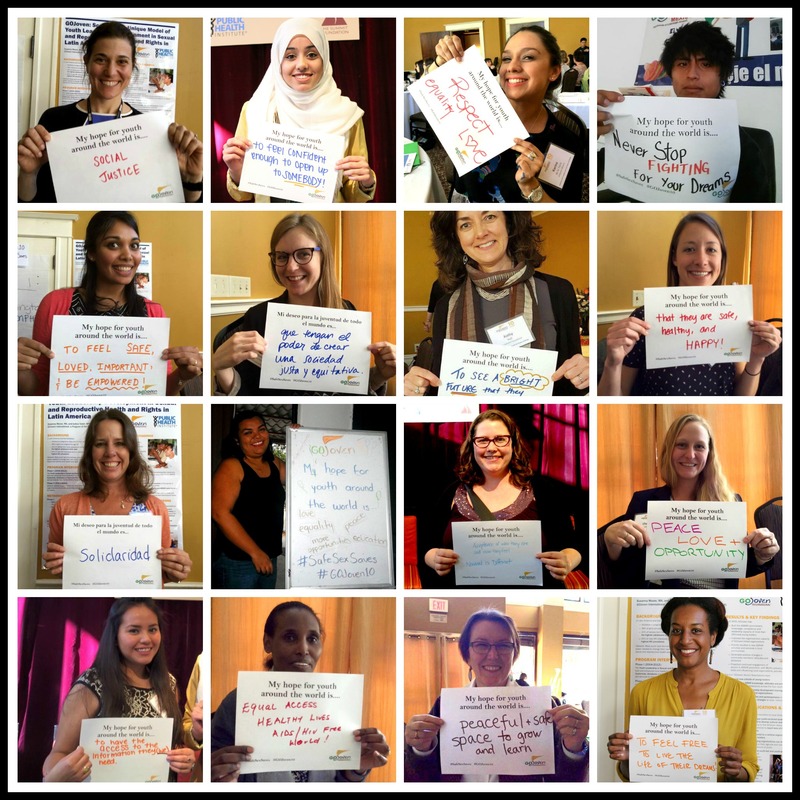 Using the hashtags #GOJoven10 and #SafeSexSaves, participants of all ages shared their hopes for youth around the world via a photobooth and created a banner with their dreams for sexual and reproductive health and rights. Follow the Twitter conversation here. Photobooth collage of participants’ hopes for youth around the world. 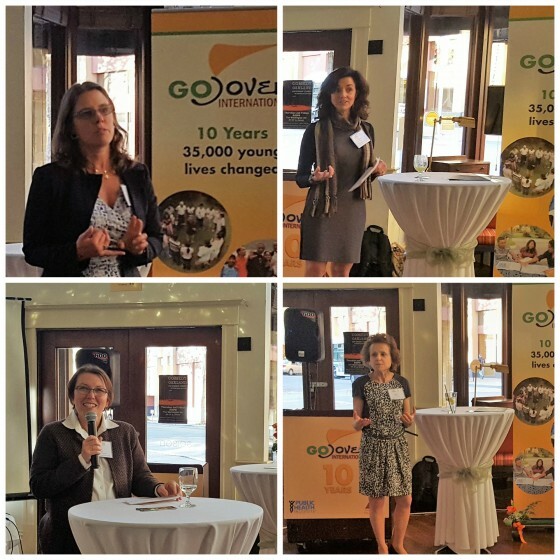 The Symposium was followed by a 10th Anniversary Fiesta featuring GOJoven pioneers, leaders and supporters who highlighted GOJoven International’s successful scale up and impact in Mexico and Central America. 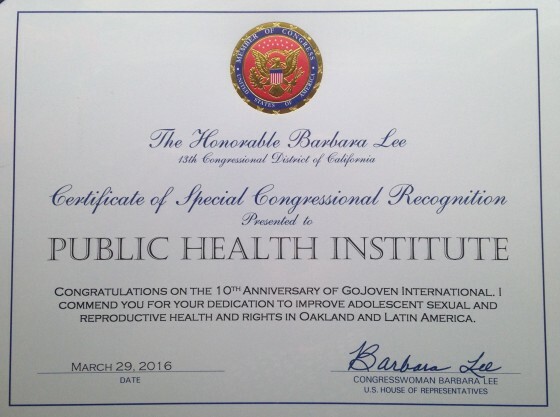 U.S. Congresswoman Barbara Lee’s Office awarded PHI with a Certificate of Special Congressional Recognition congratulating GOJoven International on its 10th Anniversary and commending PHI and GOJoven on their dedication to improving ASRHR in Oakland and Latin America. 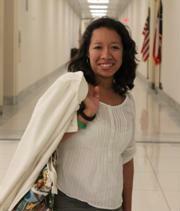 Certificate of Special Congressional Recognition to PHI and GOJoven International. The event also included the premier of GOJoven’s new video that highlights how, even in challenging contexts of high adolescent pregnancy and STI rates, sexual violence and other forms of gender discrimination, GOJoven youth leaders not only empower themselves, but also work to inspire their peers, elevate their families, and change the ASRH policies, programs, services and social norms in their countries and region. The video was presented by its director and editor, PHI’s Joanna Hathaway. PHI Leaders Mary Pittman, CEO, and Claire Brindis, Board Member, join Esther Tahrir, GOJoven International’s Founder and Director, and Summit Foundation Program Director Kathy Hall in sharing words of recognition at the 10th Anniversary Fiesta. The four new GOJoven alumni associations: GOJoven Guatemala, GOJoven Mexico, GOJoven Honduras and GOBelize, featured in the video and at the event, also shared video messages with words of congratulations and messages about the impact of GOJoven in their countries. On behalf of GOBelize Alumni Association, Eva Burgos presented the case of GOJoven scale up in Belize and, echoing other leaders who opened the event, made the case from a youth perspective for the value add of youth leadership development as a force for lasting improvements to adolescent and youth sexual and reproductive health and rights. 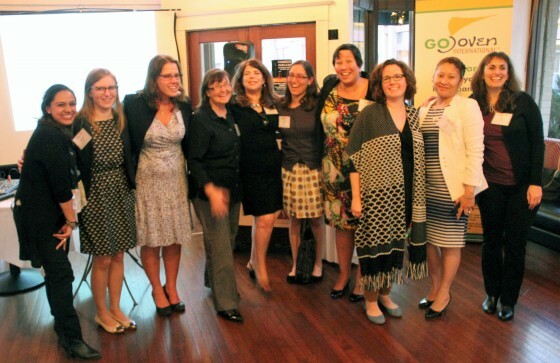 GOJoven founders, current and former staff and consultants came together to celebrate at the Anniversary Fiesta.